I looked at my previous post and felt rather embarrassed, it’s been over four months since I wrote anything. That gets me thinking of a line from Leonard Cohen “I’ve been running through these promises to you | That I made and I could not keep” Am I running out of things to say? Am I too busy for even a few lines? 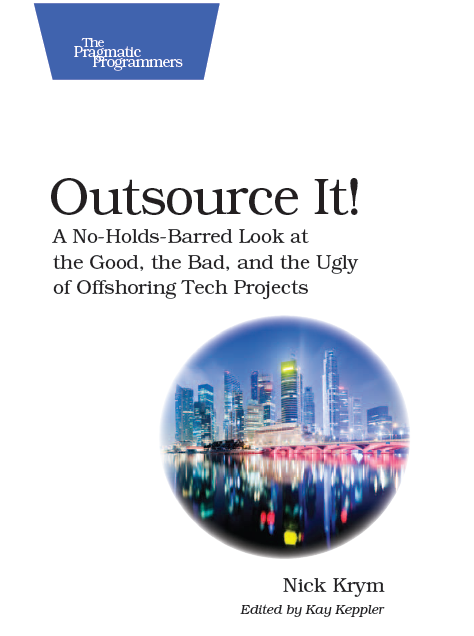 Is outsourcing is no longer an interesting topic? Well, none of that is true, I guess it’s just a combination of little and big distractions amplified by work pressure and self-inflicted pains of writing… yep, I’ve been cheating on the blog with some other creative work – writing a book based in a large degree on this blog. I’ll talk about a book later, for now just a few thoughts triggered by my latest meeting with an offshore provider we use at PDRN. A few weeks ago the president of my company requested updates from our technology offshore providers. Not being sure what were his specific needs and objectives, I turned to my vendors asking them to present their companies as if they were selling their services. Of course update need to include to-date achievements and other relevant topics. For me the sales pitch was most interesting though. The first vendor already had their 60 minute of fame and frankly I was quite pleased with what I saw. The first thumbs up goes for bringing big guns – flying several senior folks from different cities. That’s quite common for sales calls, and treating customer to some brass in an engagement midterm is a good idea. The presentation articulated well a few “key differences” mildly spiced with competition slander. If that was my first offshore presentation I would probably believe most of them. Well, even with understanding marginality of the differences it was impressive. The capabilities of the vendor were communicated well and that transformed into risk mitigation in minds of the audience. The relevance of the vendor’s capabilities to my company needs was well position and generated a few requests that might result in some business down the road. I guess that’s the area which could used a review with me prior to the meeting. Would probably generated more interest, and so on. Also, what was interesting even though it was cut short by the brutal clock is a quick presentation on technology trends. That got me even somewhat jealous – those guys have the time to stay current with the trends and ideas brewing in the market! According to the slides the technologies that are still only on my horizon are already obsolete, boy, I’m driving a slow car nowadays. Your partner should have people capable of doing the task, high caliber true technologists, not just the gadget geeks and trend chasers. Your provider should not have a conflict of interest. If the vendor has a bunch of .NET developers on the bench chances are the “next big thing” would be .NET. You should be able to define SMART goals and objectives for the “technology research” deliverables. Make sure that you request some interim and collateral deliverables that will allow you to understand the background behind the findings. Consider multi-sourcing the vision or at least getting second opinion, as R&D tasks could be heavily biased by guru’s opinion and personal preferences.